Beyond the beautiful rentals in Bellevue there lies an untamed wilderness of equal wonder. The landscape of the Pacific Northwest is thought by many to be the Most Beautiful Part of North America, typified by its varied coasts, deserts, mountains, and forests nestled between the superbly liveable cities. Nowhere is that better represented than beautiful Lake Sammamish, one of the prize freshwater lakes just east of Seattle. This area encompasses some 98 square miles, stretches from Redmond through Bellevue, and is home to a divers amount of scenery, wildlife, and parklands for visitors to explore. Thinking of taking a trip to this natural marvel? We can’t say we blame you, but recommend reading some highlights before your visit so you’re well-informed about all there is to see and do. What’s Great About Lake Sammamish? That’s all at once an easy and difficult question to answer. Easy in the fact that you need only look at the lake to see how remarkable it is, but difficult in the respect that there’s so much it offers that narrowing down a few highlights can be quite the chore. We’ve taken a stab at it though, and think that these are some of the features of Lake Sammamish that you should be keeping an eye on. Let’s take a look at some of the numbers behind Lake Sammamish State Park. The park itself encompasses 531-acres. There are 6,858 feet of waterfront, and two lakefront beaches for you to enjoy during your visit. Beyond the size and grandeur, however, this area also holds deep cultural significance. At least four Native American tribes use the area as a gathering place, and the lake is part of the accustomed fishing area for these indigenous peoples. No matter your outdoor fancy, chances are you can find it fulfilled by Lake Sammamish. If hiking and trails are your thing, you’ll be thrilled to tackle either the 1.5 miles of walking trails or the 1.5 miles of biking trails throughout the park. AllTrails has information on the best paths to take throughout the park, and you could probably make an adventure out of exploring these alone. 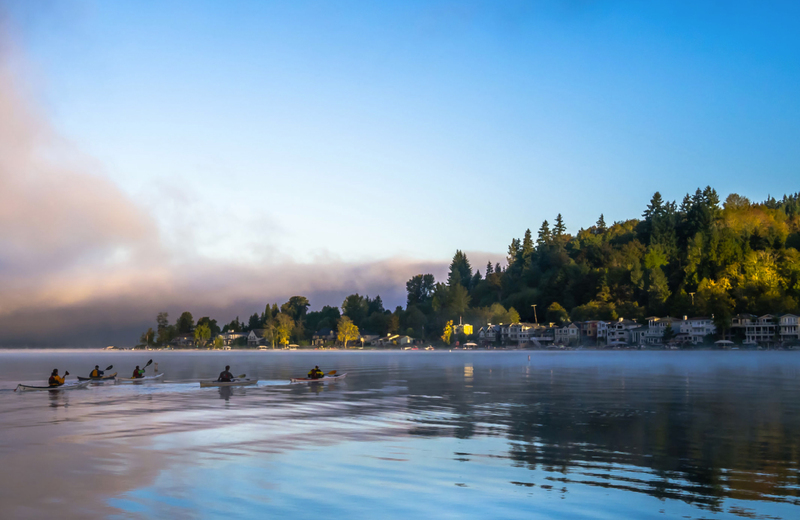 If your fascination lies in the water, you’ll enjoy the fact that Lake Sammamish permits a number of on-the-water activities, which include boating, fishing, kayaking, paddleboarding, swimming, and waterskiing. There are picnic areas and day-use facilities if you want to get together with some friends for an outdoor soiree, and there are even two baseball fields if you’d like to work on your arm or knock a few balls out the park. If you’re a wildlife enthusiast, than this is surely a place for you. In addition to the beautiful fish (trout, bass, perch, etc.) you’ll find swimming beneath the surface of the waters, there are plenty of mammalian and avian species for you to gander at. These include the Belted Kingfisher, Nutria, Canada Geese, Bald Eagle, Golden Eagle, Raccoon, River Otter, Blue Heron, Leopard Frog, and many others. If you’re thinking of an enriching, family-friendly visit to a state park, then Sammamish should be at the top of your list. The park offers both mini and junior ranger programs, designed to get kids interested in the outdoors. These range in age for youths from 2 to 12 years old, and bring up a number of topics related to the park, wildlife, and the outdoors in general. It’s a great opportunity for children to learn about the beautiful world around them. If you wanted to do some camping, or wanted to reserve time at one of the park’s retreat centers, cabins, group facilities, or vacation houses, you can check online and reserve a spot for a specific time period. This is one of the best ways to ensure there’s availability for what you want to do, and can go a long way toward avoiding disappointment because a particular facet of the park you wanted to enjoy wasn’t available. Bellevue shares a border with the lake itself, and getting to the park is a pretty straightforward journey. For most, simply hopping on I-90 East will do the trick. The trip is a mere 9 miles, which adds up to about 15 minutes under normal traffic conditions. With this amazing state park so close, why wouldn’t you want to check it out from time to time? On the approach, you’ll get to see the beautiful scenery that is emblematic of the Pacific Northwest, and make some more memories of your time living here. You can join with a “friends group” to help the park stay strong, be that through financial sponsorship, volunteering, or some other form of assistance that the park needs to maintain itself. You can visit the Friends of Lake Sammamish website to learn more about their organization, what you should do to join, and how you can help out once you do. In addition, be sure to read up on the rules and regulations of the park, so that when you do stop by, you can be a thoughtful visitor who enhances (and doesn’t detract) from this wondrous natural ecosystem. Places like Hyde Square are a perfect example. Here, among the growing and contemporary urban area of Bellevue, you’ll find a rental community that’s quite unlike any other you’ve ever experienced. Modern design aesthetics, a lovely location that brings the best of what the area has to offer, and a level of togetherness not common among other places to live make this a destination of choice for those who want their lifestyle to offer something more. Hyde Square offers the best of all worlds. Check it out today to see what your life in this Northwest paradise can truly be like.